A collaborative team of skincare experts and researchers including renowned dermatologist Neil Sadick developed this collection of three anti-aging face products based on in-office prescription treatments. Each set contains a one-month supply of the products, all packaged in small pump bottles. The Protection Cream is meant to be used in the morning–it contains SPF 20 and protects the skin from environmental pollutants. It’s also super hydrating and contains light-diffusing pigments to instantly improve the look of your skin. The Reversal Serum should be used at night after cleansing. 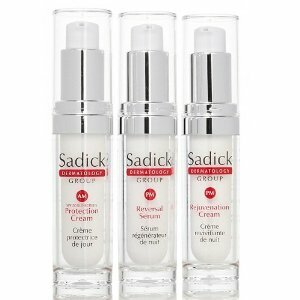 This product is full of anti-aging peptides and retinol to fight fine-lines and wrinkles. It also boosts your natural collagen. Once absorbed, the Rejuvenation Cream is applied to reduce redness and age spots. All of the products are oil-free, lightweight and feel great on the skin. Most importantly, they offer visible results! Photoaging is the number one cause of skin aging. I have to admit that I like to sunbathe, but will only do so in small doses these days when using a strong sunscreen. Nia24 recently developed new skincare products are that are specifically made for moderate to severely sun-damaged skin. These products contain the award-winning Pro-Niacin molecule that is proven to visibly improve sunspots, skin tone, texture, fine lines, wrinkles and hyper-pigmentation. The package is made up of three products that include a cleanser, exfoliating serum and cream. The Gentle Cleansing Cream is non-foaming and has the perfect consistency. It also removes face make-up very well. The Rapid Exfoliating Serum is a leave-on resurfacing treatment that nixes rough dry spots. I found this product to be very unique–It gives you a light peel that is so good to use at night. The rich Intensive Recovery Complex is a deep moisturizing cream. All products are gentle and the patented system brings a useful and continuous-release form of Niacin to the skin. I know I could certainly stand to reverse the sun damage I did to my skin as a teenager!